A woman has been accused of blackface by online commentators who have taunted her because of her appearance. However, there’s more to this story than meets the eye. Hannah Tittensor, 22, claims her darkened skin tone is a consequence of an addiction to tanning and the under-the-counter drug Melanotan, as well as sun beds. The beauty therapy student from Belfast, Northern Ireland told viewers of This Morning she has been subjecting herself to prolonged exposure to harmful sunbeds, accompanied by injections of the dubious tan-boosting substance. Hannah, who has the handle @dirtyyhippie_ on Instagram, has come under fire for tanning to such an extreme degree that many people have accused her of using ‘blackface‘, a wildly racist practice which gained popularity during the 19th century and contributed to the spread of racial stereotypes. The UK-based student was joined on the sofa by her partner Ben Dunlop, 23, who also injects Melanotan and has been using sunbeds since he was just 15 years old. I get really shallow things like, I would be better off killing myself. She also added she would consider stopping her use of tanning injections, which have not been safety tested for the UK drugs market. While addiction can affect anyone in a number of different manifestations, and is nothing to be trifled with, some commentators have criticised the couple for their dark-skinned aspirations. Others online expressed concerns for their mental health and sense of self-worth, suggesting their body image might be causing them both mental and physical harm. One said there was no difference between a tanning addiction and a surgery addiction. While their skin colour – thanks to the help of controversial products – might technically be natural, you have to question a society which perpetuates beauty ideals whereby it is desirable to emulate the physical aesthetic of a race which does not belong to you. Some might say it’s fetishisation at its most poisonous – whether meant maliciously by this couple or not. This girls looks a damn fool. Ridiculously dark "tan" fake thick lips & blue wig. Clearly being addicted to tanning I sections is a mental health issue. Same as being addicted to plastic surgery. 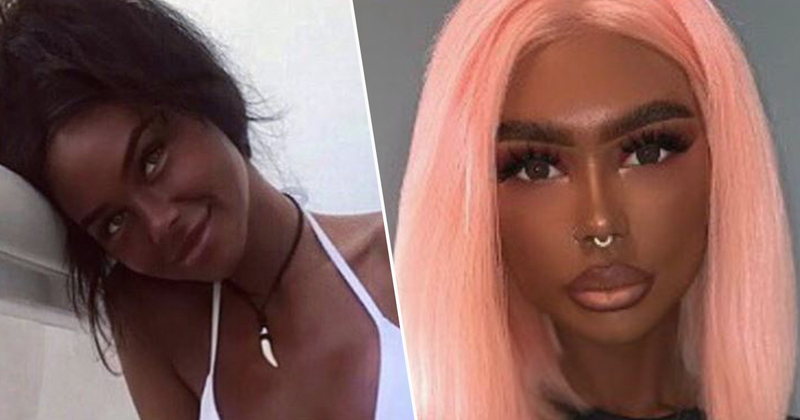 It’s a practice called ‘blackfishing’, a recently-coined term used to describe someone accused of pretending to be black on social media by using makeup, hair products and in some cases, surgery to drastically change their appearance.